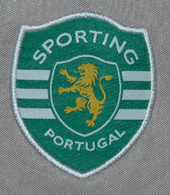 Puma greatly improved the quality of its shirts in the second year of contract with Sporting. 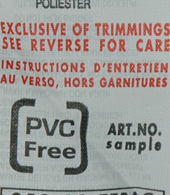 However, the innovations in the jerseys still led to arguments among the supporters. 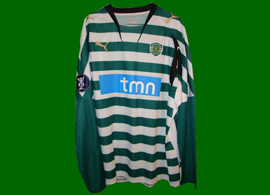 In particular, the Sporting Clube de POrtugal shirt in 2007/08 had nine or ten green hoops, which was considered simply too much, and led to the introduction of the recommendation that not more than six hoops should be present. 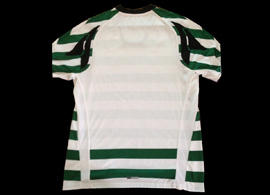 The home Sporting jersey suffered, once again, from having a large all green area on the back for the player name and number, thus interrupting the stripes that effectively are not stripes at all. The classic Stromp jersey was basically equal to the previous years. The away third shirt was again black, with details in yellow. The main sponsor continued to be PT, but other companies from the same telecomms group, such as TMN, started to be introduced as well, and also the bank BES. The Carlsberg brand is on the shirts worn by the players in the League Cup games, because Carlsberg was the sponsor of that competition. 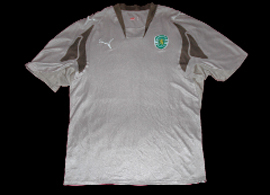 Click here to see all the Sporting Lisbon shirts from 2006 2007. After a home defeat against Manchester United, Sporting travelled to the Ukraine to play against Dynamo Kyiv and win 2-1. 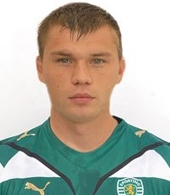 The centre-back Tonel scored the first goal, but the ukrainians equalised at the half hour. The other Sporting Lisbon centre-back, the brazilian world champions Anderson Polga, scored the winning goal still in the first half. Paredes, who only played four official games this season, entered in minute 32 of the second half to replace the exhausted Romagnoli, wearing the jersey shown below. This was the only Champions League match where Sporting used the away kit. With the ukrainian Autumn chill, most of the shirts were longsleeved. Match worn by Paredes in the CL game Dynamo Kiev vs. Sporting 2 October 2007. 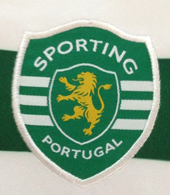 Sporting won 1-2. 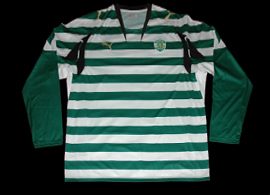 Click here to see all the Sporting Lisbon shirts from 2008 2009.